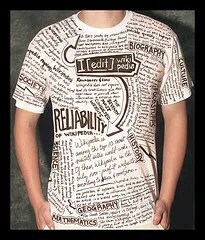 Write for Magazines, Not on T-Shirts! This isn’t just advice about writing for Working Mother – it’s about writing for all magazines! I found that gem in Magazine Writing That Sells by Don McKinney. It’s a great book for freelance writers – even experienced ones. Okay, here are several magazine writing tips from published freelancers and authors…. Similar to this is knowing how to set yourself apart as a writer. For more magazine writing tips, read Writing as a Career – Who Else Wants to Get Paid for Writing? What have we missed? I welcome your writing tips or questions below! Hi, i am aspiring to write…my own personal story…i did journalism in 1999, can’t remember a thing. A friend has started a magazine and i would love to help him out….just to prove myself. i love writing….i am always writing and this time it has to be for money…and professional, WHAT IS YOUR ADVICE?